Joplin, Mo. 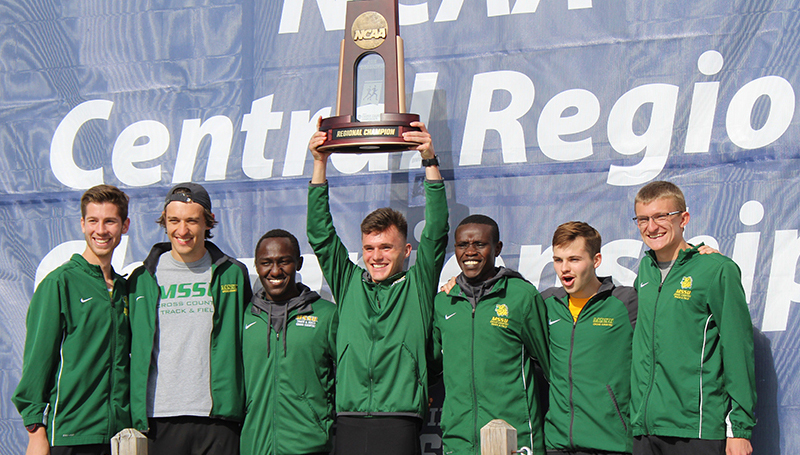 — The Missouri Southern men’s cross country team won the team title, while freshman Gidieon Kimutai was the individual medal winner as the Lions competed today at the 2018 NCAA Division II Central Region Men’s Cross Country Championships at the Tom Rutledge Cross Country Course. It is the first time since the 2009 season the Lions have won a team title and it’s the lowest score (55) they’ve posted at a regional, besting the 56 points scored in 2009. Kimutai cruised to the individual title, crossing the 10k finish line in a time of 29:48.5 to take home the individual championship. He is the third Lion in the last four years to win the individual title (Vincent Kiprop – 2015, 16). Nicson Kiptoo and Cody Berry crossed the finish line in identical times of 30:13.3 for third and fourth place, respectively, while Josh Webb placed 13th in a time of 30:53.6. Kimutai, Kiptoo, Berry and Webb all earned All-Region honors for their efforts. Michael Shanahan was 34th in a time of 31:24.0, while Kevin Koester placed 44th in a time of 31:46.0. Jared Ozee rounded out the Lions’ scoring in a time of 32:08.4 to place 54th. The Lions won the team title with 55 points, besting Augustana (73) by 18 points. Sioux Falls placed third with 113 points and all three teams earn automatic berths to the National Meet on December 1 in Pittsburg, Penn. Karim Achengli of Northwest Missouri and Jacob Klemz of Washburn earned individual berths to the National Meet. Minnesota-Moorhead was fourth, followed by Southwest Baptist, Fort Hays State, Nebraska-Kearney, Pittsburg State, East Central and Washburn to round out the top ten team scores. The Lions will race again at the 2018 NCAA Division II National Championships on December 1. The race will be held in Pittsburgh, Penn. as part of the Division II Fall Festival.